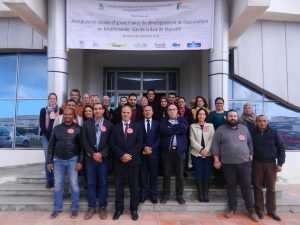 Following preliminary stakeholder interviews (May and June 2018) and a first workshop on July 2018 devoted to the diagnostic of aquaculture development in the Bay of Monastir, the MedAID project organized a final stakeholders workshop on November 28. Part of the social acceptability and governance work implemented in the frame of MedAID, the workshop was organized and took place at INSTM building in Monastir, thanks to the support of Dr Naceur Dhraief. 28 participants from aquaculture, fisheries, tourism, NGOs, harbour or research sectors attended the workshop where the social acceptability of aquaculture in the Bay of Monastir was addressed through a set of scenarios. Scenarios were built according to the preliminary interviews and diagnostic. Through a multicriteria approach, participants were invited by Ifremer (Loeiza Lancelot), LISODE (Jean-Emmanuel Rougier) and UBO (Pascal Raux) to position themselves and collectively on social acceptability criteria. Debates were fruitful and animated, leading to an important material to assess the social acceptability of aquaculture development in the Bay of Monastir. Results of the analysis will be delivered to stakeholders in a report by the end of 2018. Workshop about fisheries and aquaculture interactions in the Bay of Monastir, Tunisia. November 27th. A MedAID workshop was organized in Teboulba on November 27 in order to gather fishermen opinion about aquaculture and interactions between coastal fisheries activities and aquaculture. The workshop took place at the professional fishing training centre in Teboulba harbour, along the Bay of Monastir. Fishermen were rarely involved in participatory process regarding aquaculture issues. The poor weather conditions on November 27 favoured the participation of a large number of fishermen (more than 20). 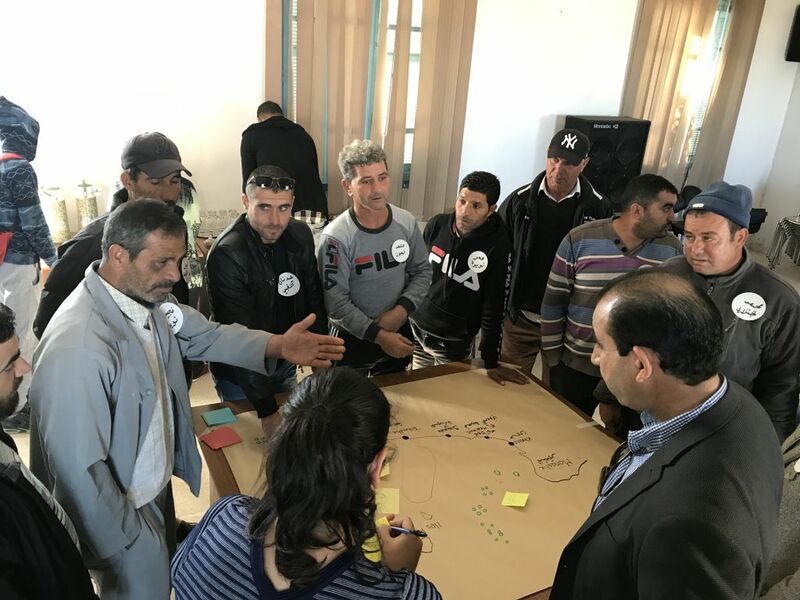 Implemented in Arabic and facilitated by INTSM (Dr Naceur Dhraief) and the NGO “Notre Grand Bleu” (Manel Ben Ismail), the workshop allowed fishermen to express their opinions and to map their interactions with aquaculture. Better management practices and coastal fisheries issues were also addressed. The collected material was also used as an input for the stakeholder workshop implemented in Monastir the day after.